We have already covered the backlash against a plan to establish Tahiti’s first mosque, resulting in its closure shortly after opening and death threats directed against its imam, Hishan el-Barkani. 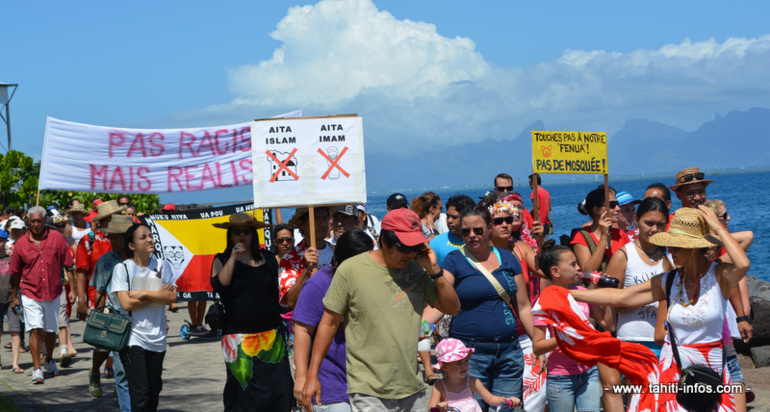 Des Dômes Et Des Minarets draws our attention to a 400-strong anti-mosque demonstration that took place last weekend in Papeete, the capital of French Polynesia. In addition to the predictable “no to the mosque”, the slogans that featured on the banners and placards carried by protestors included “no to Islam, no to the imam”, “the burqa, yuck”, “hands off my pig”, “la charia faut pas charrier” (which loosely translates as “sharia shouldn’t take the piss”) and “not racist but realist”. This entry was posted in France by Bob Pitt. Bookmark the permalink.